Folger Pinnacle instrument platform, part of Ocean Networks Canada's Folger Passage site, is now back online, streaming data and video from 23 m below sea level in Folger Passage. This instrument platform was reinstalled by divers last month but could not be reconnected to Folger Node because, at 100 m, it is too deep for diver operations. We originally planned to reconnect it during the autumn maintenance and installation cruise aboard the R/V Thompson, but when ship repairs delayed our cruise until next spring, we scrambled to find an alternative. Fortunately, it is now up and running, thanks to help from the crews of the Georgia Transporter and the CanPac Oceanic Explorer remotely operated vehicle (ROV). The Georgia Transporter barge, with ROV onboard, arrived in Bamfield on 15 October, but bad weather delayed dive operations for 4 days. Seas were still somewhat rough on the day of installation, with 2.7 m swell measured that morning at La Perouse Bank to the west of Vancouver Island, but crew members were able to successfully launch the Oceanic Explorer. 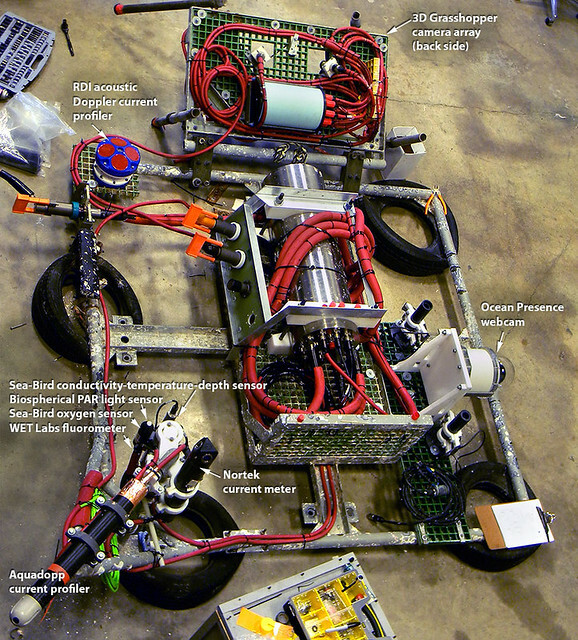 The ROV dove to the seafloor, retrieved the cable-end connector, and plugged it in to Science Port 2 on Folger Node. We were delighted to find that once connected, electrical and communications were established without a hitch. One of the really interesting instruments on this platform is the Ocean Presence video cam, which provides a live video window to the fascinating and prolific reef habitat there. Dubbed "ReefCam", the video camera is now online and streaming live. The video can be viewed both via our ReefCam and the Oceans 2.0 camera page. At a depth of 23 m, enough daylight filters down to Folger Pinnacle to clearly see fish, anemones, sea stars, barnacles, sponges and many other creatures inhabiting the reef. The camera system is also equipped with lights, which bring out the vivid colours of this rich environment. For our initial phase of use, we plan to turn the lights on daily, 8:00-8:45 AM and 12:00-12:45PM. Many thanks to the crews of the CanPac Oceanic Explorer ROV (Dave, Tim, Cal) and the Georgia Transporter barge (Geoff, Todd, Ben, Nolan and John). Thanks also to Bamfield Marine Science Centre for their facility support.